May 11, 2015 Nefer Khepri, Ph. 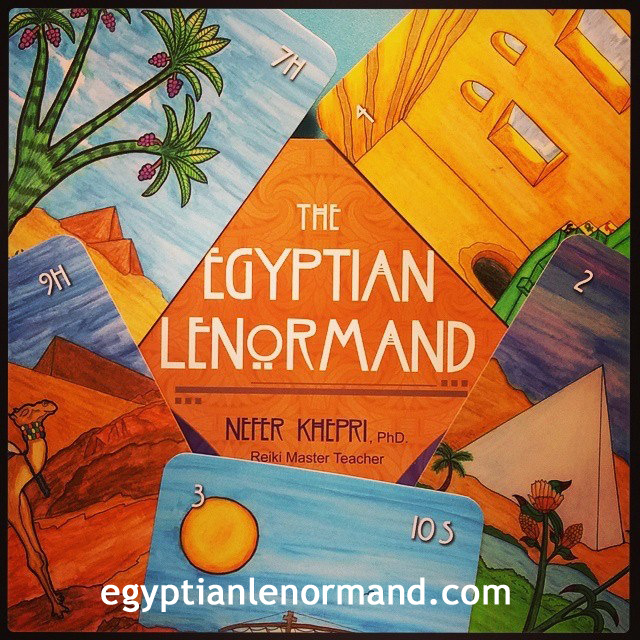 D.
The Egyptian Lenormand (C) Nefer Khepri 2012 & 2015, (C) Schiffer Books 2015. I have received another shipment from my publisher, Schiffer Books, & I now have additional copies of The Egyptian Lenormand back in stock. They come signed and I take them personally through the entire Activation Ceremony as presented in the accompanying guidebook. Your deck arrives activated for the additional uses of healing and magical manifestation should you decide to use it in that manner. Although it does arrive activated I do recommend you also take your own deck through the Activation Ceremony as discussed in the book. This will lend your own unique energies to your deck that will result in even greater accuracy in your readings. Currently I have only 9 copies in stock, all ready for immediate shipping. I ship worldwide. In America I ship via Priority and elsewhere I ship via First Class Air. The Egyptian Lenormand now has seven reviews posted on Amazon. Each reviewer gives The Egyptian Lenormand 5 stars. I thank every person who was kind enough to take the time to post their review to Amazon. “When I opened the box & removed the cards they tingled in my hand. It kind of scared me & I almost dropped them. I’ve never felt anything like that before. I immediately did a reading with them & WOW! That’s all I can say. I was floored. Thank you for creating such a lovely deck that really speaks to me.” ~ Kara, Brookfield, IL. “I have never read Lenormand cards. I don’t know what they are, but I just HAD to buy your deck because I have had a life-long love of all things having to do with ancient Egypt. Your artwork is lovely. The bright colors just seem to dance off the cards. They all look so pretty together. I love the book. It is the only book I have read about Lenormand cards and your keywords and descriptions of the cards, plus the sample readings you include have made learning very easy for me. 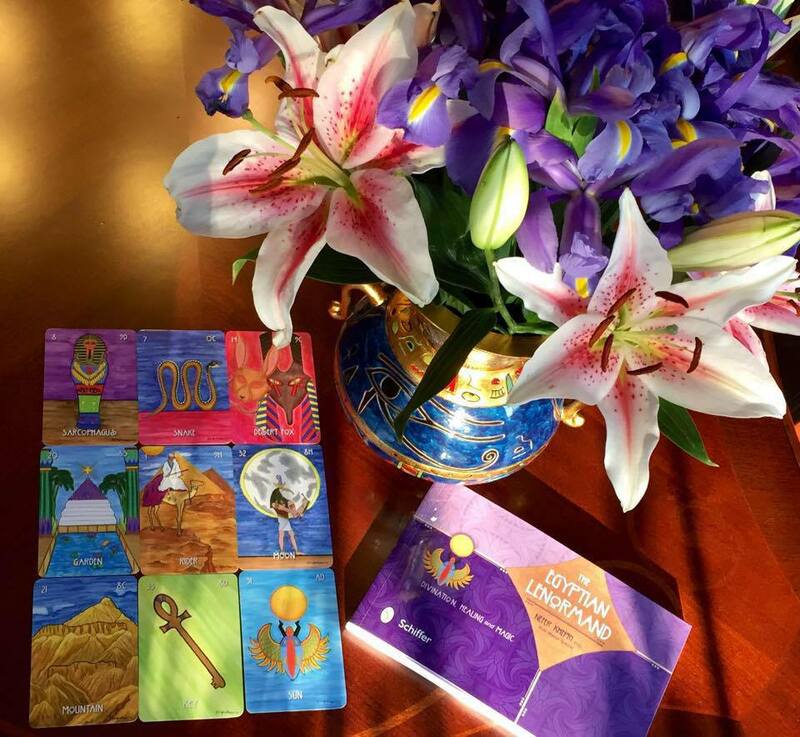 I thought it would be hard like tarot, but it’s not – thank God!” ~ Kathleen, Boca Raton, FL. “I really didn’t think Egyptian imagery would work well with the Lenormand system. I bought your deck simply out of curiosity. I prefer to work with more traditional decks like the Blue Owl, which is my favorite, but I have to say once I read the book I could easily see how you merged the Egyptian imagery very well with traditional Lenormand card interpretations. Where symbols deviate they do so for good reason & I appreciate how well you explain this in the book. I’m very glad I bought this deck & look forward to years of using it.” Martha, Boulder, CO. If you’d like to read more, Amazon reviews are posted at Amazon. I am including the links to three video reviews as well. The first is by Beth Henry of Divinationary. You can find it here at her YouTube channel. The second is by Anita Perez of A Metaphysician’s Journal. You can find her review on YouTube as well. The third is posted by MonsoonMagick at her YouTube channel. I am very grateful to Beth, Anita & MonsoonMagick for their informative reviews of The Egyptian Lenormand. Please do check them out. I conclude with a lovely collage photo done by Bobbie Jo Drake. If you follow me on Twitter you will recognize this image, no doubt. I thank Bobbie Jo for her kind permission to use her photo. Collage photo created by Bobbie Jo Drake, used with kind permission. Preview: my next blog post will focus on how to invoke Archangel Saint Michael to cleanse your home of negative energy so stay tuned for that. Thank you for following my blog & feel free to leave comments.